Between its addictive bouncy production and sharp-edged flows from Stevie Stone and Tech N9ne, “808 Bendin” is knocking heads all around the country as the lead single for Tech N9ne Presents Stevie Stone – Rollin’ Stone. As the single makes its rounds this summer, some of Stevie Stone’s peers are taking notice of the smash hit. Freestyle champion Blind Fury recently hit the web to shout out “808 Bendin”, calling it “somethin’ crucial.” Blind Fury’s skilled lyricism previously landed him a guest spot on “So Lonely” from Tech N9ne’s best-selling All 6’s And 7’s. Fans may also recall that Blind Fury and Stevie Stone were even set to collaborate at one point. With Rollin’ Stone on deck, perhaps the two emcees will finally make something happen. 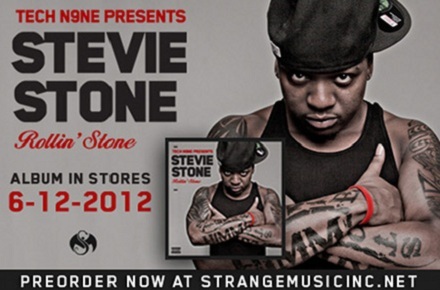 Stay tuned for more from Stevie Stone! How do you feel about Blind Fury and Stevie Stone working together?